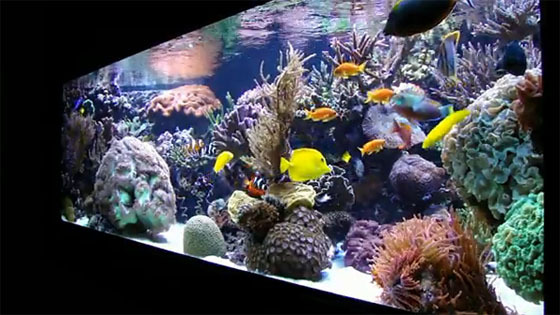 Here is an incredible video of Manuel’s 575 gallon (2178 liter) in-wall reef aquarium. This tank is filled with large colonies, and an assortment of fish. This reef video shows various species of anthias, clown fish, wrasses, tangs, and many more. Beautiful, mature soft and hard coral colonies fill every inch of this large reef tank. Outstanding polyp extension is evidence of pristine water conditions. The many close-up shots demonstrate the ample, variable flow that was achieved in this setup. Late in the video, we are also provided a glimpse into what this reef looks like with the moon lights. Tell us what you think.